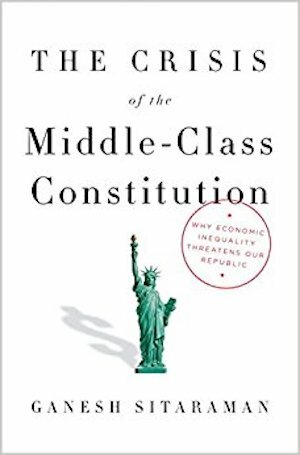 Ganesh Sitaraman argues that a strong and sizable middle class is a prerequisite for America’s constitutional system. In his fine book, both history and call to arms, Ganesh Sitaraman argues that the contemporary explosion of inequality will destroy the American Constitution, which is and was premised on the existence of a large and thriving middle class. He has done us all a great service, taking an issue of overwhelming public importance, delving into its history, helping understand how our forebears handled it and building a platform to think about it today. Like any pathbreaking exploration of a topic, the book invites challenges from many directions. One wonders, for example, why Sitaraman chose a class schema (upper, middle, lower) that omits the working class ... On the whole, however, the book succeeds in its central objective: presenting a strong case that economic inequality isn’t just a matter of fairness or economic efficiency; it’s about the survival of our constitutional order. Americans who value the republic can only hope that judges, legislators and we the people take heed. Constitutional forms have given way to congressional polarization, executive imperialism and judicial improvisation, and voters left and right have concluded that 'the system is rigged.' Mr. Sitaraman plausibly insists that these phenomena are connected. Unfortunately, he fails to pursue the thought with the rigor it deserves ... The author offers a withering account of the plutocracy of the Gilded Age, followed by a conventional account of the Populist, Progressive, and New Deal heroes who sought to bring corporations to heel ... Mr. Sitaraman complements this lamentably polemical account with a list of familiar and ill-conceived reform ideas ... That said, his book provides a much-needed reminder: For all our legendary good luck, nothing ordains that all our constitutional stories will have a happy ending. What did you think of The Crisis of the Middle-Class Constitution?